EARLYBIRD SPECIAL! On the morning of Monday, March 28, the waning gibbous Moon will align with the planet Mars. You can’t miss Mars due to its distinct rusty red color, like a new shiny copper penny! 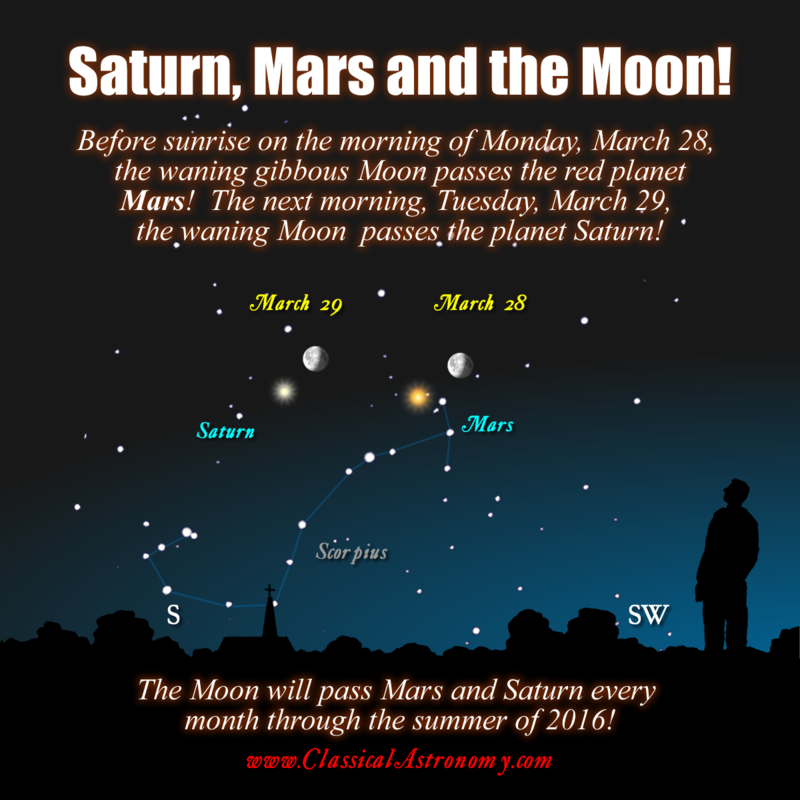 The next morning, Tuesday, March 29, the Moon will pass the planet Saturn. If you’re up before the Sun on these mornings, check out the Moon as it passes these planets. Mars and Saturn will remain parked close to each other in Scorpius through the rest of the spring and summer of 2016. We’ll soon be writing a newsletter to explain why. For this reason, the Moon will pass Mars and Saturn on successive nights each month through the fall of this year. These planets will enter the evening sky in a few months, joining Jupiter. When Venus and Mercury also swing into the evening sky, all five visible planets will share the sky together! This will make for a very interesting evening sight this August! Stay tuned to Classical Astronomy for more information!